Head-mounted display (HMD) based telepresence in the mobile manipulation robot Momaro and in an interactive simulation of the Centauro robot with haptic input device were shown. The CENTAURO project was presented at the joint euRobotics booth of the Automatica 2016, the 7th International Trade Fair for Automation and Mechatronics, June 21-24 2016, Munich. 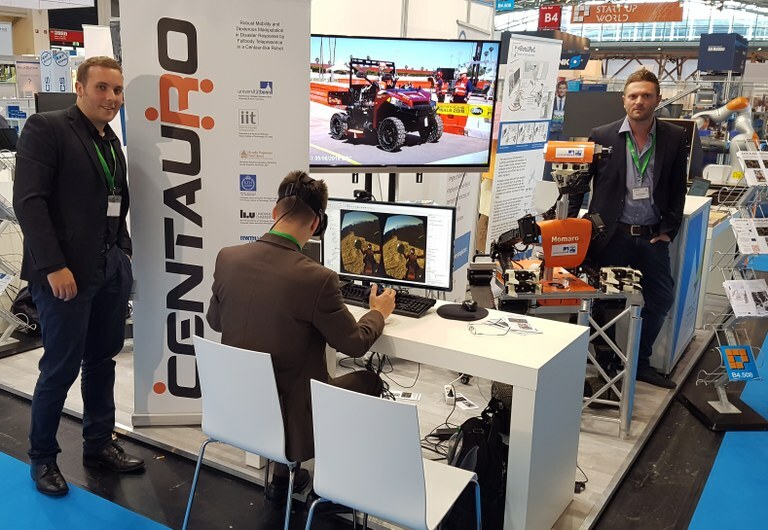 The CENTAURO booth is presenting the concept of the CENTAURO project to the visitors with the MOMARO robot (Bonn) and the Verosim Simulation of Centauro robot concept (RWTH).